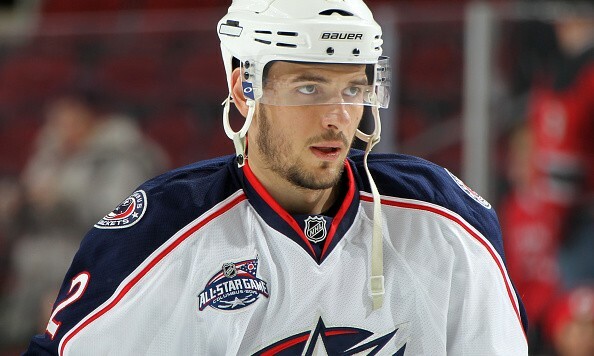 Every NHL team has to deal with injuries over the course of the regular season. Though it seems like fans of every team claim to have dealt with the most or the worst injuries, the handy “man-games lost due to injury” statistic reveals which teams had the worst luck when it comes to the injury bug. 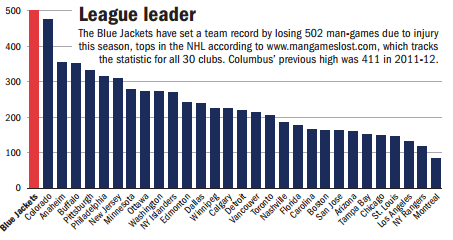 Via the Columbus Dispatch (with help from Man Games Lost), the Columbus Blue Jackets had a total of 502 man-games lost due to injury. That figure led the NHL and set a new franchise record for the most man-games lost due to injury. Six knee injuries, five concussions, four bouts with the flu, three broken fingers, two stress fractures in the back, one accelerated heart rate, an infected hand, a torn biceps and groin injuries. Is it fair to blame Columbus’ poor season on all of their injuries? Yes and no. Injuries to key players obviously makes life difficult, but you’ll see in the chart above that Anaheim, the team with 109 points in the regular season, had the third-most man-games lost due to injury. The Ducks, and several other playoff teams found in the top-10 in terms of games missed, proved that depth is the key. On the other end of the spectrum, teams on the right side of the chart (fewest games missed) tended to be fairly successful. That’s a pretty obvious conclusion, but as with any stat, there are outliers. The LA Kings had the third-fewest games missed yet they failed to reach the playoffs. Depth may be the key, but the Kings proved that a healthy roster won’t always result in a shot at the Cup.